Vishal Sikka said on Friday he would step aside after escalating criticism from the co-founders over his compensation and strategy. Infosys Ltd. begins the search for a new chief executive officer this week with a tough set of requirements for any candidate: The person must be capable of leading a 200,000 employee organization, willing to tackle sweeping changes in the outsourcing industry and brave enough to drop in the middle of open warfare between the company's board and co-founders. The bedlam cost the company its current CEO, Vishal Sikka, who said on Friday he would step aside after escalating criticism from the co-founders over his compensation and strategy. The board defended Sikka and took the highly unusual step of calling out by name ex-Chairman Narayana Murthy for what they called his "inappropriate demands" and destructive involvement. The billionaire responded with a dire warning that he would respond "in the right manner" in the future. The open hostilities will make it difficult to draw top candidates from outside the company and likely increase the chances an internal executive will be elevated to CEO. The Bangalore-based company, India's second-largest outsourcer with more than $10 billion in revenue, also faces deep business challenges, from slowing growth and automation to hostility from the Trump administration in its most important market. 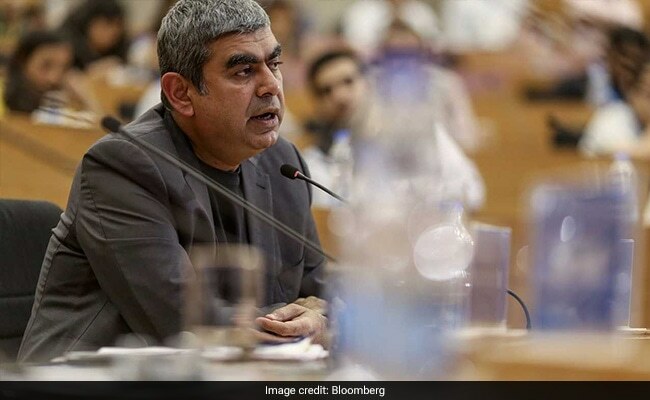 "It's a tough one," said Ashutosh Sharma, the New Delhi-based vice president and research director at Forrester Inc. "They'll find it hard attracting global talent of Vishal Sikka's caliber." Fifty-year-old Sikka, a Ph.D. in computer science from Stanford University and the former chief technology officer of SAP SE, is credited with fostering innovation at the company, stemming attrition, boosting margins and pulling in a growing roster of large corporate customers. He helped increase Infosys's revenue by about 25 percent since taking the helm three years ago. The company's shares plunged 9.6 percent Friday after the announcement of his departure, wiping about $3.5 billion off of its market value. The board approved a stock buyback of $2 billion to help bolster shares. "Talented candidates will hesitate," said Sharma. "They'll wonder how much autonomy they'll get as CEO considering all that's happened." Infosys has little time to waste in choosing a successor. Among the internal frontrunners are Pravin Rao, a long-time Infosys hand named interim chief executive on Friday, and Chief Financial Officer Ranganath D. Mavinakere. Ranga, as he is known, has been at Infosys for over a decade-and-a-half and holds a degree from the high-profile engineering school, the Indian Institute of Technology, like the founders Murthy and Nandan Nilekani. The boyish-looking Ranga, 55, who worked closely with Murthy during his second stint as Infosys chairman, may also be able to navigate the tensions between the board and co-founders. At Friday's press conference, Sikka praised Ranga and highlighted his role in improving cash holdings to more than $5 billion. Infosys announced last month that it was relocating Ranga to the U.S., where it derives about two-third of its revenues from customers such as Lockheed Martin Corp., Avis Budget Group Inc. and Goldman Sachs Group Inc. Sikka, an American of Indian origin and the company's first non-founder chief executive, was also based in the U.S. and lived in Palo Alto, Calif.
Also possible internal candidates are Deputy Chief Operating Officer Ravi Kumar; Rajesh Krishnamurthy, who leads the energy and telecoms units; and Mohit Joshi, who heads the banking business. One challenge looms for any internal candidate however. If any are chosen over Rao, dubbed the "accidental CEO" by local media, they will supersede him and have to navigate how to share power. The billionaire founders and their cohort hold about 13 percent of the shares in Infosys, yet have disproportionate influence because of their high-profile status. Infosys said in a release on Friday that they fear continuing damage by 71-year-old Murthy who they said "may be in the process of engaging in discussions with certain key stakeholders of the company to further his criticisms of the board and management." Murthy did not respond to an email and Nilekani declined to comment. Mohandas Pai, the company's former chief financial officer identified as part of Murthy's cohort, called the board dysfunctional. "It has to be reconstituted if the new CEO has to have a chance," said Pai in a telephone interview. The board, on the other hand, said it would work in the next few weeks to "put founder issues to bed" and provide "air cover" for the chief executive. An external candidate for CEO may be daunted by the precedent, unless the founders sell their stakes. Sikka was the first outsider to run the company and he was brought in by Murthy after three decades of founders rule. Sikka said the "continuous drumbeat of distractions and negativity over the last several months and quarters inhibits our ability to make positive change and stay focused on value creation." Plenty of talented executives outside the company will be interested in the top Infosys job, said Pai who himself left Infosys after being passed over for the CEO post. "It's a prized job," he said. Top global talent may also balk at the company's frugal culture, established in part by Murthy, who helped found Infosys in 1981 with $250 borrowed from his wife and espouses Gandhian values. Sikka's spending came under fire, with open criticism of his chartered flights and prime Palo Alto office. "They don't have long," said Sharma of Forrester. "The sooner they find a new CEO, the faster they'll get back in the game."